A cochlear (koe-klee-er) implant is a surgically implanted device that provides electrical stimulation directly to the inner ear. Children and adults with severe to profound sensorineural hearing loss in both ears and who do not adequately benefit from hearing aids may be helped with cochlear implants. A sensorineural hearing loss typically means there is damage to the hair cells in the part of the inner ear called the cochlea. Because of this damage, sound cannot reach the auditory nerve. A cochlear implant bypasses the damaged hair cells and directly stimulates surviving auditory nerve fibers to provide sound information. Cochlear implants have external (outside) parts and internal (surgically implanted) parts that work together to allow the user to perceive sound. External parts: The external parts include a microphone, a speech processor, and a transmitter. The microphone picks up sounds and sends them to the speech processor. The speech processor may be housed with the microphone behind the ear, or it may be a small box-like unit typically worn in a chest pocket. It is a computer that analyzes and codes the sound signals and sends them to a transmitter worn on the head just behind the ear. The transmitter sends the coded signals to an implanted receiver just under the skin. Internal parts: The internal (implanted) parts include a receiver and an electrode array. Thereceiver is surgically placed just beneath the skin behind the ear. Its job is to take the coded electrical signals from the transmitter and deliver them to the array of electrodes that have been surgically inserted in the cochlea. The electrodes stimulate surviving fibers of the auditory nerve, and the patient perceives sound. What is involved in the process of getting a cochlear implant? Candidacy: Once a patient is referred to our clinic, testing is performed to determine whether the patient is a cochlear implant candidate. After audiologic candidacy is determined, the patient is counseled on the cochlear implant process including expectations, differences between cochlear implant manufacturers, time and commitment required to achieve maximum benefit from a cochlear implant, etc. When the patient is ready to proceed, he/she is referred to a surgeon (Otologist or Neurotologist) for further testing to determine surgical candidacy. This process often involves examination using CT scans and/or MRI (magnetic resonance imaging), consultations with additional physicians as needed, and further counseling. We work closely with several surgeons in our area who routinely perform cochlear implant surgeries. Each of these steps is performed to ensure that the patient will benefit from a cochlear implant and will have motivation to participate in the process. Surgery: Once audiologic candidacy and surgical candidacy have been established, surgery is the next step. Surgery is approximately 2 hours and is typically performed on an outpatient basis. Specific surgical details can be discussed with your surgeon. Post-op: Patients typically follow-up with their surgeon 2-3 times post-op to ensure proper healing. Approximately 4 weeks after surgery and after clearance from the surgeon, the patient returns to our clinic to begin the cochlear implant programming process. The patient is fit with the external parts: the microphone and speech processor. 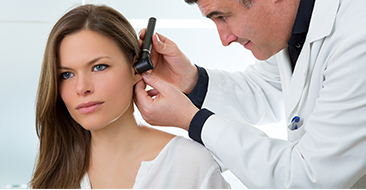 The audiologist activates and begins programming (called mapping) the implant. Frequent follow-up visits are necessary in the first few months of programming as the patient is adjusting to sounds heard through the implant. Once the patient's programming is stable, follow-up programming visits are not as frequent and are based on each patient's individual needs. There are multiple aural rehabilitation services available for cochlear implant patients. Our audiologists work as a part of an inter-disciplinary team in order to best serve the cochlear implant patient throughout the entire process.